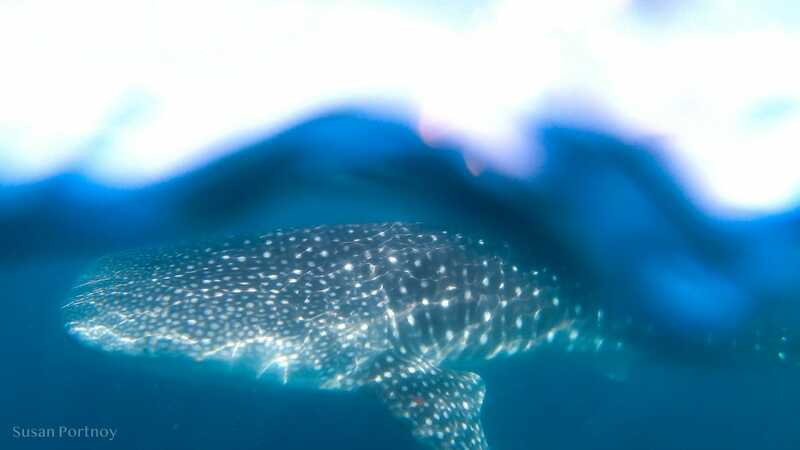 The idea of swimming with whale sharks made me nervous. I wanted to desperately but the memory of my bizarre reaction to a spinner dolphin in Costa Rica a few years ago haunted me, and I was afraid I’d humiliate myself, yet again. I’d been completely and utterly irrational. I was in the water near Peurto Jiménez when I saw a dolphin swim toward me, its dorsal fin slicing through the water like a……. SHARK! Reflexively, my body seized control. Adrenaline coursed through me while a lightning bolt of panic sent me back to the boat and up the ladder gasping for air. My guide couldn’t figure out what happened. The trip had been filled with beautiful sun-drenched days, spectacular sunsets, hikes, snorkeling, kayaking, swimming with sea lions, a lot of good food, and new friends. Our last excursion was the crescendo to an already unforgettable trip: A morning in the Bay of La Paz communing with the world’s largest fish. Despite what their name and size might imply, whale sharks are docile and barely seem to notice humans swimming beside them. It’s weird really, it was as if we were invisible. Once briefed, we were on the lookout for our target megafauna. It wasn’t five minutes before we spied the tell-tale white spots of a whale shark glistening under the waves in the distance. My breath caught with excitement and a dollop of dread. Please don’t let me freak out again. Per Alex’s instruction, the three of us who wanted to snorkel (the rest preferred to watch from the boat) sat at the edge of the swim platform at the stern of the Carolina. Snorkel, mask, and flippers on and ready to go. She pointed to the shark up ahead to our left. Seconds later, she waved us forward like a SEAL commander directing her team and then disappeared into the froth. For a moment, I lifted my head to locate Maria and was struck by the difference in views. Above the rolling waves, I could see our boat, my companions’ snorkels, puffy white clouds crossing a bright horizon. In contrast, only a few inches below the surface was a graceful behemoth gliding through its milky domain. Perhaps that’s what intrigues and frightens me about the ocean. It’s so alluring, yet there is so much going on I can’t see. His mouth opened wide and I could see a little tornado of spinning water form as he sucked in. When his mouth closed his gills rippled as if in a stiff breeze from his exhalation. Again, his mouth opened and closed, and as he did so he rotated until I could see his broad back and the stunning pattern of dots and lines that made up his unique signature. Swimming again, he came toward us. We backed away furiously and to the side to get out of his way but moments later it seemed as if he were coming at us again. I wasn’t frightened, it wasn’t aggressive. But between the power with which he propelled himself and the waves sweeping me in his direction I thought for sure we were going to crash. Love this! I want to swim with whale sharks so badly! Definitely on my bucket list! It’s really wonderful and not scary at all. I hope you are able to do it. How exciting! I would be very nervous jumping in the water with a creature, as beautiful as it is, of that size. Your adventurous spirit is admirable and inspirational! Thank you for sharing your experiences. Such a dream! I missed this by about a week when I was on Holbox in Mexico 🙁 This experience is firmly on my bucket list. Definitely do it when you can. How was Holbox? A friend suggested I go. Woooah what an amazing experience! I love the photos too! I guess if you do something that amazing, I guess you sort of have to buy one!! Oooh clever! Year I looked at DSLR cases, they are crazily expensive aren’t they!! At least you’ll be able to keep using the gopro for other adventures!! Don’t blame you for getting scared. I would’ve too. You mean with the dolphin? It was the dorsal fin cutting through the water that ignited my fear. It looked like a scene out of jaws. I can tell you the whale shark was surprisingly not scary. I think it’s because they act as if you’re not there and hence not threatening. It was amazing how calm I felt considering its size. It really just goes about its business and doesn’t really care that you’re there. It’s remarkable, really.